Installing a new flower garden requires considerable time, effort, and money. Most flower gardens don’t reach their full potential for two to three years, especially when perennial flowers are the focus. It’s true that flower gardens need more maintenance than lawns or mulched shrub areas, but it doesn’t take a special skill set to care for a thriving garden. If you’ve amended and tilled your garden soil until it’s as fluffy as pancake mix, you’ve gotten your flowers off to a good start. Don’t be surprised if, the following season, you have the same hardpan soil you had before you started the garden. Earthworms and microbes feed on organic matter in the soil, and your flowers have been feeding on this matter too. 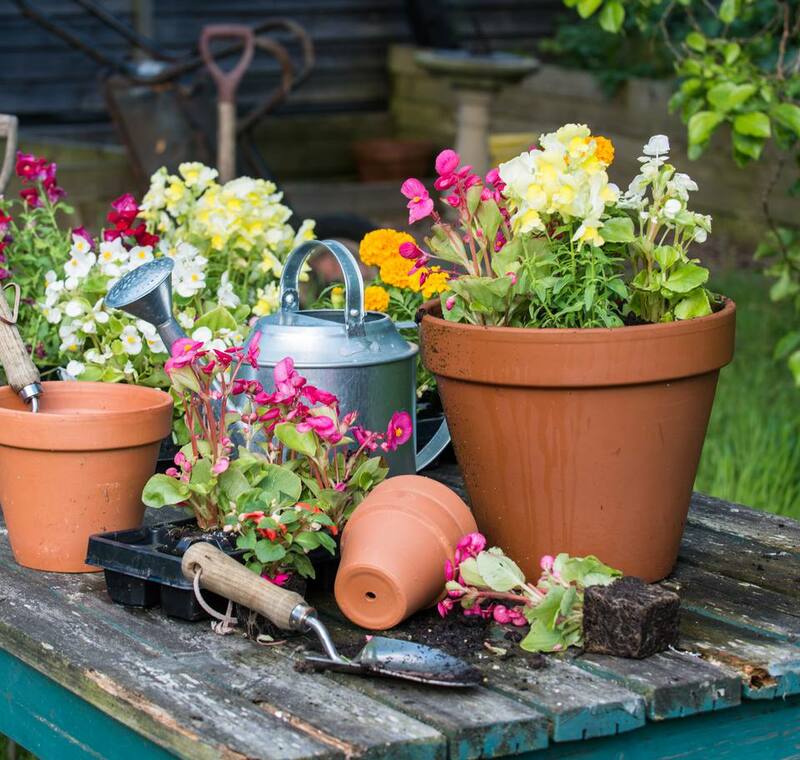 Add new organic matter, like compost, leaf mold, or manure to your flowerbeds every year to nourish young plants and improve soil tilth, whether you have heavy clay soil or lean, sandy soil. A three-inch layer of mulch will protect delicate feeder roots and will moderate soil temperatures. There’s much to consider about watering your flowers: if, when, how, and how much. Too much water brings on rot, too little makes flowers wither and die. Overhead watering can encourage the spread of disease, and some watering systems deliver more water into the atmosphere than into the soil, where it’s needed. In general, a few deep watering sessions will benefit your flowers more than daily sprinkles. Follow plant tag watering suggestions, and consider updating your irrigation system if you’re tired of moving your oscillating sprinkler around your yard every other day. If those numbers on the fertilizer packaging have always been a mystery to you, it’s time to get in the know: The standard system represents the available amount of nitrogen, phosphorus, and potassium, by percent, in that order. The reason the numbers don’t add up to 100% is that the packages also contain filler materials, like sand or limestone. In general, nitrogen promotes foliage growth, phosphorus develops root systems, and potassium helps flower formation. Flowering plants need all three nutrients. Follow package instructions regarding the amount and frequency of fertilizing. Too much, and you could burn your plants. Not enough, and your bloom count will be sparse. Remember that not all flowers are equal in their appetites; heavy feeders like roses and many annual flowers need regular nutrients to keep up the blooming. Most wildflowers, bog flowers, and plants with fleshy, succulent leaves like moss rose prefer to get by on the nutrients found in the soil. Different flowers attract different insect pests, but you probably know that some insects are beneficial in the garden; don’t assume every creepy-crawly on your plants is there for a snack. Some insect pests are nocturnal or too tiny for detection, so look for clues in the damage they leave behind. Caterpillars chew leaves from the edges inward, while beetles leave holes in the middle of leaves. Look at pictures of aphids and whiteflies and learn to identify these pests that congregate in large groups. Choose insect controls that yield the highest pest death rate with the least impact to the environment, including bees and other beneficials. You can choose from traps and barriers; sprays and powders; or biological controls like predatory insects and nematodes. Besides looking ugly, weeds cause other problems in the flower garden. Weeds take up water and nutrients that your flowers need, and weeds provide a habitat for many garden insect pests. Control weeds early and often, both because small weeds are easier to kill than large ones, and because large weeds produce seeds for the next generation. You have three options for weed control in the flower bed: preventing them in the first place, spraying them, and using mechanical options like hand pulling or hoeing. If your flowers are in decline, it’s important to determine whether the culprit is an insect or a disease process. Spraying insecticide willy-nilly on a plant covered with rust fungus isn’t going to help. Practicing good plant culture, like proper plant spacing and watering techniques, goes a long way to reducing disease problems. Following the recommended exposure guidelines also keeps flowers vigorous and able to resist disease. If disease strikes you anyways, you can treat with fungicide or selective pruning techniques. In severe cases, sometimes it’s best to remove the plant and replace with a hardier cultivar. What Does the Fertilizer Label Actually Mean?